The imperfections are always the best part. Ceramic artist, Samantha Carter of Brasstown, North Carolina agrees. Her pottery is functional, well designed and uniquely her own. As Samantha shares, "The asymmetrical compositions and organic shapes are small reminders of the hand that made the work." Samantha began working with clay at Florida State University. She soon found a love for functional ceramics and played with styles before she found her signature one. 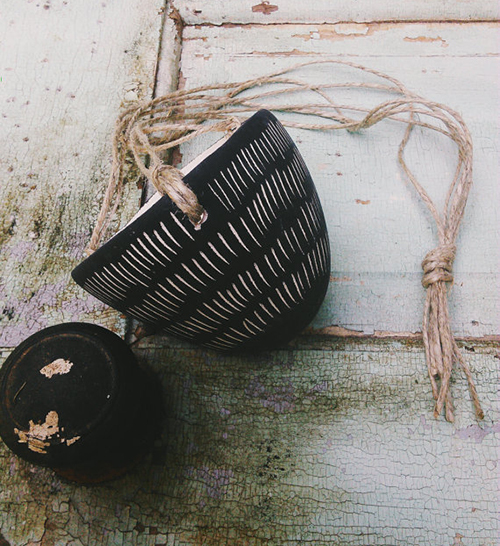 She is known for her black and white handcrafted design of table and hanging planters but she continues to expand her wares to include bowls, plates and jewelry. Samantha, "I make pottery that is useful with aesthetics and design always in mind. As a lover of drawing first and foremost, I try to incorporate the hand drawn line into most of my work via the technique of sgraffito, in which painted clay is carved into while still wet, revealing the natural clay color beneath."